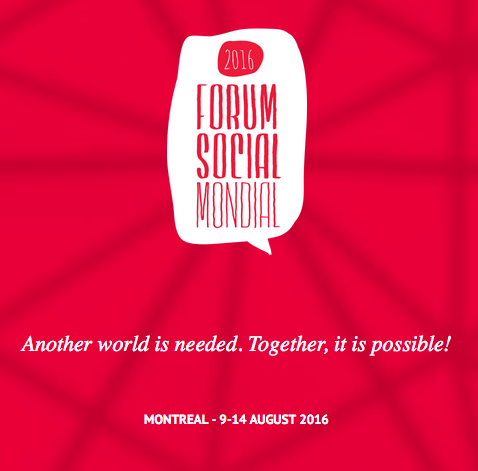 The International Council of the WSF enthusiastically welcomed the idea of holding a World Social Forum (WSF) in Quebec for 2016. The goal of the WSF 2016 is to gather tens of thousands of people from groups in civil society, organizations and social movements who want to build a sustainable and inclusive world, where every person and every people has its place and can make its voice heard. Join this collaboration and solidarity process between the North and South, East and West, and between the older generation of social actors and the new movements of indignation, resistance, decolonization and occupation that have emerged around the world since the Arab Spring of 2011. In order to build real alternatives, it is now urgent to unify humanity around a solidarity between people beyond divisions, to collectively take back power over our lives and thereby to open the horizon of possibilities. The Collective WSF 2016 in Quebec brings together, since May 2013, individuals working within various Quebec organizations, professionals event planning, artists, academics and concerned citizens around the goal of organizing a WSF in Quebec. There are five core values at the heart of this collective and human process: inclusion and openness, transparency, horizontality, self-management and independence. To join the team or to get involved in the organization of the WSF, email info at fsm2016.org.